The US is the country with the most to disclose, being the location of the Roswell incident, holding mummified dead alien bodies, and with lots of MJ12 video tape on the Roswell survivor, Skinny Bob, to share. But the US is also the country at the helm of the cover-up over the alien presence, and thus the most reluctant to admit the truth. The bigger the lie, the longer it has been perpetrated, the harder it is to reverse and confess. There were hints last January that Medvedev might lead the disclosure, as detailed in Issue 327 of this newsletter, and the matter was reportedly discussed at the World Economic Forum. But the UN and the Vatican are too timid and reluctant, as noted last February in Issue 333. Control is the issue. The elite like to be in control. How can one get huggy with aliens if they can’t be in control? How might all this relate, then, to a very private letter Obama sent to Putin recently? Per the Zetas, Obama knows that it is inevitable that the pending admission that Planet X, aka Nibiru, has been in the inner solar system will put the spotlight on ZetaTalk. And from that, given the astonishing ZetaTalk accuracy, it is inevitable that the cover-up over the alien presence will break. President Barack Obama wants to ease diplomatic tensions with Moscow and had a letter hand delivered to President Vladimir Putin to propose new ways to cooperate. Obama's national security adviser, Tom Donilon, met with Putin and other officials and presented the letter in an effort to improve relations. ZetaTalk Insight 4/20/2013: Why would one Head of State send a letter to another, rather than get on the phone? What can be put into a letter cannot be overheard, as even scrambled phone calls can, and can carry coded information. Coded information can be arranged in the order of words and letters, in the double meaning of words, and in the emphasis placed on words by repeated use of such words. If the letter is intercepted, this cannot be discerned on the face of the message, so all speculation is just that, speculation. What was being relayed? What would be so secret? There is only one issue not openly discussed by the media and openly admitted by Heads of State – the joint cover-up over the presence of Nibiru, aka Planet X and the cover-up over the alien presence. Admitting the cover-up over Planet X is in the works, and because of the accuracy of ZetaTalk it is anticipated that the cover-up over the alien presence will simultaneously break. Russia will work closely with Obama on these matters, as they have been more open with their citizenry over both issues. Planet X, aka Nibiru, has been admitted on their TV and Nancy and ZetaTalk quite popular in Russia and likewise getting TV coverage in Russia. Russia will be countering the efforts by many clinging to the cover-up in the US by creating an Internet storm, with ZetaTalk at the center. The cover-up crowd would like to promote their own spokespersons, a matter Obama does not want to succeed. 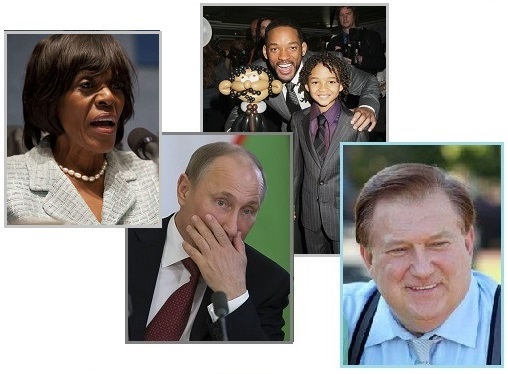 Then there are all the tacit and open admissions about aliens from notaries like Obama, Fox News Bob Beck, Ex Congresswoman Kilpatrick, and the young son of actor Will Smith of the Men in Black movie. Is this creeping disclosure? Where the CIA and DIA have, in the past, attempted to control the public’s embrace of the visitors with scare tactics, other movies such as ET and Paul have countered that obvious lie. If aliens could mass land and consume mankind, what has been holding them back? Clearly there are rules, and clearly MJ12 guests such as Skinny Bob are not here to colonize the Earth. On a trip to the White House with his dad (Men In Black superstar) Will, mother Jada and sister Willow, he found himself in the President's Situation Room. I talked to President Obama about extraterrestrials. He said he could neither confirm nor deny the existence of aliens, which means they're real. The Fox News Channel's Bob Beckel Admits We Have Had ET Contact! On Fox News Channel, Friday, April 5, 2013, hosted by Eric Bolling, Greg Gutfied, Dana Perino, Andrea Tantoaros and Bob Beckel, (Democratic strategist). They usually discuss news of the day and politics in a round circle format. Bob Beckel began his comments, "I think, I have to be a little careful on how I say this. I think there absolutely has been visitors from other places on this planet." This was a pretty amazing statement coming from a source that has worked closely with the White House and the Democratic Party. The 30 hours of congressional-style hearings kicked off Monday and are scheduled to run through Friday at the National Press Club in Washington, D.C. Those testifying hope to prove that aliens contact Earth — and that the government is trying to keep it secret. ZetaTalk Insight 4/20/2013: Inevitably, during the announcement admitting the nearby presence of Nibiru, aka Planet X, it will be noted that ZetaTalk was right about the matter all along. And how could this not raise the issue of the alien presence, especially when the public begins to explore the long track record of ZetaTalk accuracy on many issues. Where human science was ignorant or puzzled about so many issues, the Zetas explained these scientific principles – the gravity repulsion force, the nature of Nibiru as a wandering planet on a sling orbit, the solar system lying within a larger magnetic field, the speed of light not being the limit, and the futility of nuking asteroids to name but a few. It was we, the Zetas, who predicted the arrival of Planet X in 2003, precisely where and when we stated many years earlier. It was we, the Zetas, who predicted the Earth wobble that began in 2004, after Planet X arrived in the inner solar system, as we knew the magnetic influence of Planet X would cause this. It was we, the Zetas, who described the 7 of 10 plate movements and the date they would commence, with our astounding accuracy once again. If anyone has been unaware of ZetaTalk, the admission that Nibiru is real and has been present near the Sun for some time will introduce them to the history of the ZetaTalk saga. And how could this all be true, while the alien presence is false? In Issue333 of this newsletter the Zetas stated that Greer’s claim that his little mummified corpse was an alien was a CIA directed hoax, to test how the public would react to disclosure on the alien presence. Now that DNA tests have come in, it appears the mummy is composed of human remains, per the Zetas quite obviously a premature infant. So sayeth the documentary airing in April. Per the Zetas, Greer has long been a puppet of the establishment. 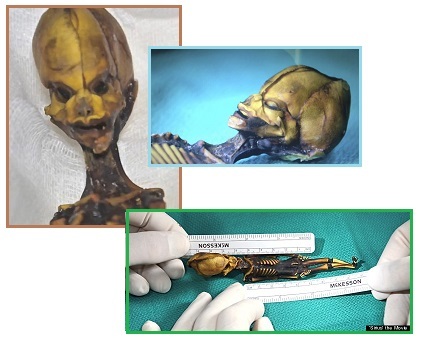 The mummified remains of what looks like a 6-inch space alien has turned "Sirius" into the most eagerly awaited documentary among UFO enthusiasts. The findings, however, might come as a disappointment. In early publicity, filmmakers claimed the documentary would reveal that the DNA of the creature with an oversized alien-looking head couldn't be medically classified. In fact, the film, which premiered in Hollywood, features a scientist who concluded the little humanoid was human. The primary force behind "Sirius" is Steven Greer, a former emergency room doctor who founded the Center for the Study of Extraterrestrial Intelligence (CSETI) and The Disclosure Project. ZetaTalk Explanation 5/4/2013: As we explained when Greer’s fraud alien first appeared in the media, this is not an alien creature. The CIA, which has Greer on puppet strings, is testing the public’s readiness for disclosure. They are as usual on these matters, dragging in the dust behind the eager public. If this is not a tiny alien, what is it? It is obvious that this is the mummified skeleton of a premature human infant, lost in the desert as the mother stumbled home after a spontaneous abortion. 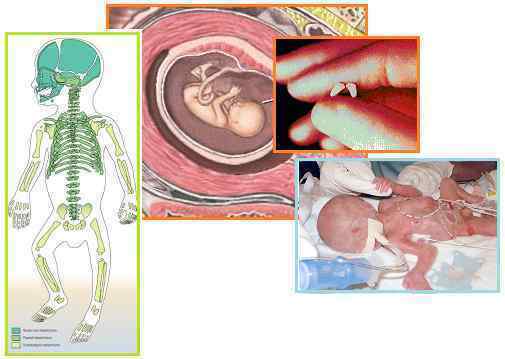 Nature most often aborts infants with malformed genetics very early in the pregnancy, but some live on for a few months. 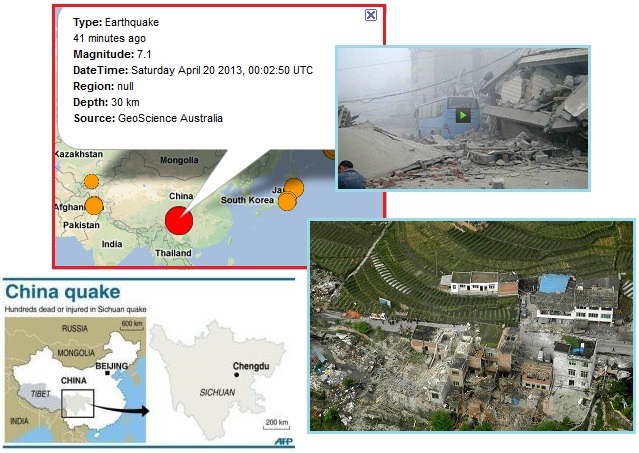 Why should the magnitude of a quake in China range from 7.1 to 6.6, when reported? Shouldn’t the report from China, the epicenter, rule? GeoScience in Australia reported it as a 7.1. China called it a 7.0 and then moved it to a 6.9. But true to form the USGS quickly dropped it to a 6.6. The USGS has long been shown to dumb down the magnitude of quakes so that statistics generated tend not to show a rise in earthquakes. A 7.1 thus must be pushed down under 7.0, so it falls in the lower category. The USGS is obviously still at it, lying to the public under orders from the establishment, who want the status quo to continue. No panic among the workers and taxpayers. Only the elite are to know the truth. The U.S. Geological Survey initially put the magnitude at 7, but later revised it down. The populace reports the ground trembling or reports hearing booms, but all this is denied by the authorities and only occasionally gets into the news. Certainly the number of earthquakes gets reduced, often in front of amazed watchers who see the earthquakes deleted from online databases in front of their eyes. Increasingly prevalent earthquake swarms are hard to explain, so what is the USGS to do? If you can’t hide them anymore, just give them a different cause! Thus we find scientists explaining that swarms to the west of the Appalachian Mountains were caused by the Hurricane Sandy storm surge! The theatre of the absurd has opened. Hurricane Sandy's fateful left turn toward the mid-Atlantic Coast in October last year lit up earthquake monitors all the way to Seattle. 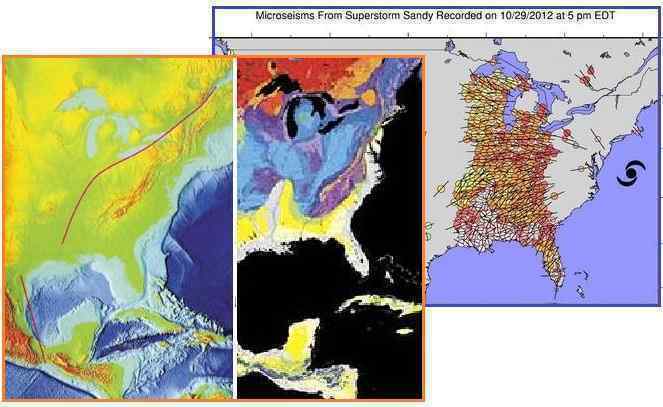 When Hurricane Sandy veered on Oct. 29, the sudden increase in crashing ocean waves sent rumbles through the Earth detectable on seismometers. The wave-on-wave collisions created what are called standing waves, doubling the energy directed at the seafloor, scientists reported today. The ocean gave the seafloor a little shove, sending seismic waves through the Earth. ZetaTalk Statement 4/20/2013: Hurricane Sandy occurred during the Earth wobble, which had been regularly sending Atlantic storms veering into the East Coast, as had occurred during Hurricane Irene the year before. The wobble affects more than the atmosphere as the globe lurches around beneath it. It also affects the plates, which are jerked around and smash into one another. Thus the notable increase in earthquakes as the Earth wobble increases. Of course there were minor quakes along the New Madrid Fault Line. Notably there were NO minor quakes in the Appalachian Mountains or the East Coast! The quakes were hardly a result of a storm surge, they were the result of the wobble, which these scientists are not allowed to discuss. Earth and Mars apparently have much in common! 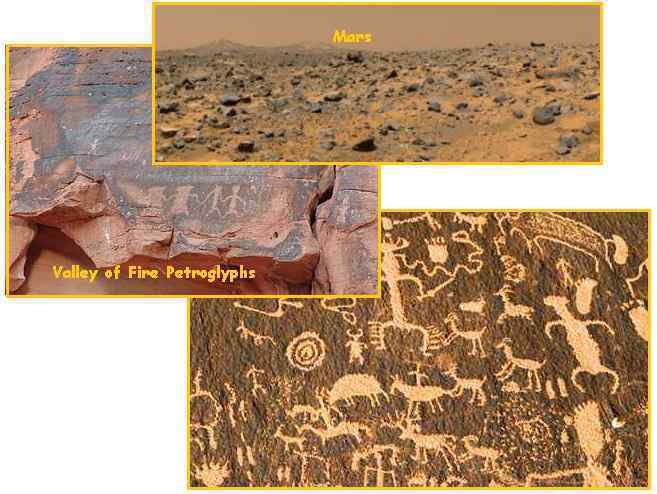 A little understood phenomena called Desert Varnish has long puzzled mankind, who carved petroglyphs into the coating. This has been found on deserts on Earth, and on Mars. Per the Zetas, no surprise that both planets share this phenomena, as it is caused by the red dust in the tail of Planet X, aka Nibiru. Do Mars Rocks Have Desert Varnish? Some people believe that rock varnish results from an interaction of small amounts of water from humidity in the air with the surface of rocks -- a chemical reaction that forms a coating. ZetaTalk Explanation 4/20/2013: Desert Varnish is merely the traces of red dust from the tail of Planet X, melting in water vapor or fog and then baked by the Sun, repeatedly. The only mystery is where the red dust comes from, as the passage of Nibiru, aka Planet X, is denied by mankind who prefers to let the trauma of these passages slip from memory. Of course Mars rocks have this varnish on those rocks where the red dust clung and did not blow away, or where the fog or water washing them in lakes and rivers and streams did not wash the dust away into the subsoil. Early man on Earth discovered they could easily scrap designs into the varnish, and often reported the passage that had just occurred as part of the stories told by the designs. Desert varnish is not the only thing shared by both Earth and Mars. They also both have hawks! If mice infested Mars, inadvertently brought along by the Annunaki with grain transported from Earth, then how to control the infestation? If the US military relies upon drones to travel far and wide with eyes in the skies, the Annunaki apparently chose desert hawks to control the rodent population. The mice live there still and so do the hawks! This pair can be seen, one standing guard while the other spreads its wings closer to the ground for an air bath. 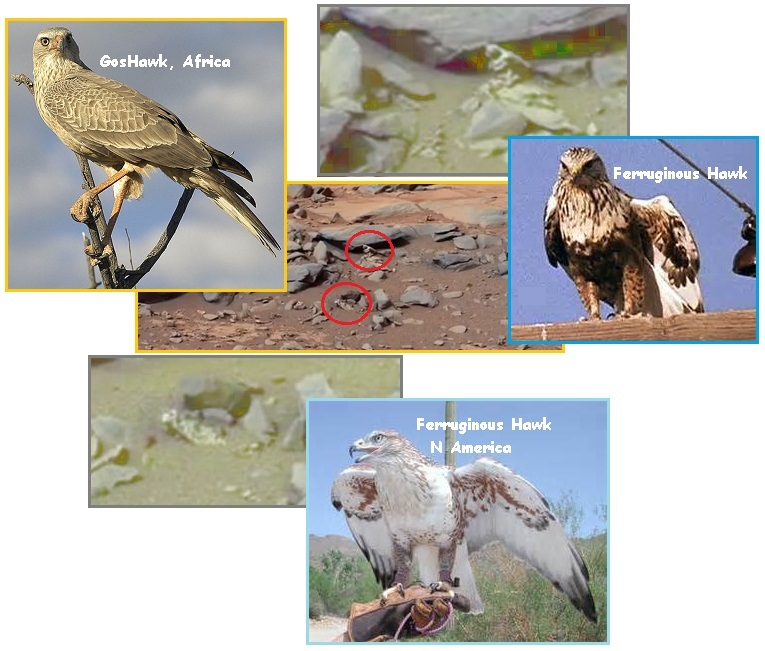 They seem to most closely resemble the coloration and feathered legs of the Ferruginous Hawk - Buteo regalis – of the N American deserts. Nesting Sites: Large nests made of sticks are on cliffs, the ground, or trees. Pairs sometimes build multiple nest sites but only use one. Prey: Prairie dogs, rabbits, ground squirrels, and other rodents. 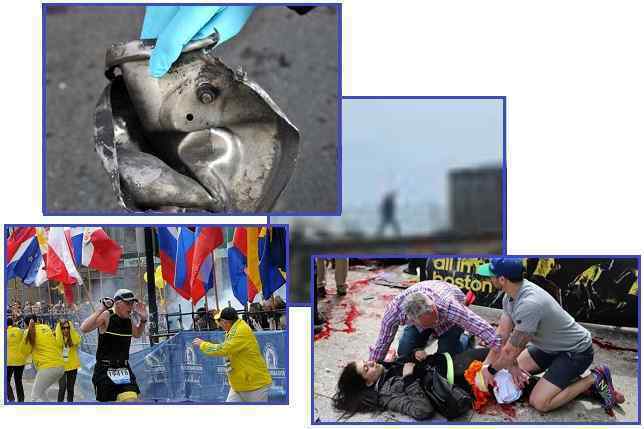 The ZetaTalk written on the Boston Marathon bombing is an example of ZetaTalk accuracy. The question was posed on the ZetaTalk Q&A on April 15, 2013, the day of the bombing. The answer was prepared on the morning of April 17, and the clues were called into the FBI at 8:15 am that morning. The ZetaTalk was posted to the ZetaTalk website by noon on Friday April 19, and posted on the Pole Shift ning early Saturday morning April 20. How did the Zetas fare? The Zetas stated the bombers were local residents, would likely be identified from video and photos at the bombing site, and purchased the bomb components locally. By Friday April 19 it was known the bombers were local residents. The Zetas stated this was not part of a jihadist network with overseas connections, though an attempt to give that appearance was done. Days later on April 23 the news was reporting that the surviving bomber was not going to be charged as an “enemy combatant” but rather that the brothers were acting alone. The Zetas stated that the perpetrator, clearly the older brother, was sullen and disgruntled and resentful as he had not succeeded in life as others had. The older brother proved to be a high school dropout, then later became a college dropout. He was in the Golden Gloves but was passed over for the Olympics. He was having trouble getting the US citizenship granted to his younger brother due to an assault charge on his record. Arrogant and dictatorial, relying upon his athletic prowess for status, he fit the Zeta description. While the media seemed determined during the week following the bombing to establish a connection to overseas jihad networks, the Zeta explanation for a motive has been holding true. The Zetas also stated that the older brother had felt slighted by a family and marathon runner likely to be at the finish line, and that these individuals were the target and motive for the bombing. The explosions occurred on April 15, tax day, which could be a further indication of a domestic connection. But the bombs were not directed against a government building or institution, which is often a hallmark of disaffected, lone-wolf domestic terrorists. And the style of the attack, in which one explosion was closely followed by another, mimics that used by numerous groups in the Middle East. The scale of the attack and the crude nature of the explosives, coupled with the lack of anyone claiming to have been the perpetrator, suggested to experts that the attacker could be an individual or a small group rather than an established terrorist organization. Rudimentary explosive devices made from pressure cookers have been widely used in attacks in Afghanistan, India, Nepal and Pakistan, all countries where the cooking device is common. Instructions for assembling such devices can be found in many places on the Web, including in terrorism “cookbooks” popular among domestic extremists. In the episode “Turban Cowboy,” which aired March 17, 2013, the bumbling dad character Peter befriends a Muslim man who involves Peter in a plot to blow up a bridge in the fictional town of Quahog, which he does by mistake at the end of the episode shortly after winning the Boston marathon. Alex Jones is convinced that the Federal Reserve, operating on behalf of a shadowy group of global banking elite, is preparing to use the tea party and patriot movement as a scapegoat to initiate mass gun confiscations, collapse the U.S. economy, and ultimately usher in a global currency and one-world government. 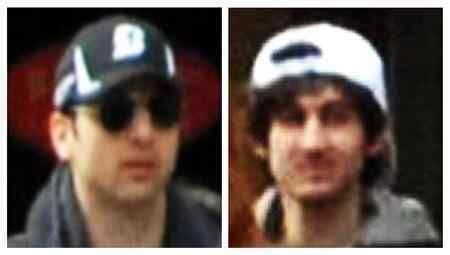 ZetaTalk Prediction 4/20/2013: Despite all the conspiracy theories, the Boston Marathon bombing has a simple motive and the perpetrator’s identity is obvious. Where the techniques used were typical of the bombs placed in Afghanistan and Pakistan, the recipe is broadly on the web for all to access, and the items cheap and available to anyone – a pressure cooker, nails, gunpowder, and an egg timer. This will prove to be assembled locally, with the perpetrator identified via store videos and a simultaneous purchase of all the items at once. The authorities will also likely have other evidence of the identity of the perpetrator, such as DNA or fingerprints, or photo recognition in association with placement of the bombs. What was the motive? The bomb timer was set to go off at the finish line at a time when the front runners were expected to be crossing the line. This scene was staged to disguise the murder and maiming of a runner and his family, who were expected to be clustered in the area at the time. It was punishment, for various slights and insults in the past. The perpetrator was trying to hide behind the assumption that the bombing was caused by Middle Eastern terrorists, due to the recipe being one used in Pakistan and Afghanistan. The perpetrator will likely be identified as a Boston resident, sullen and given to holding grudges, a failure in his own eyes and resentful of the success of others.